Edward Glyver grew up believing himself to be the son of an authoress and a drunkard, living in near poverty, with no title or status in society. Upon the death of his mother, however, he discovers in her diary that his origins are actually much more scandalous and that he may actually be entitled to much more in life. Before he can claim his status in the world, especially with his true-blood family, he is going to need proof to back up his (and his dead mother’s) claims. So Edward sets out to find solid evidence of his birth and birthright for once and for all, leaving behind his entire life and following leads obsessively. He learns that an old schoolmate-turned-enemy is standing between him and what is rightfully his, and he realizes that by whatever means necessary, his arch-nemesis must be “removed” from the equation. 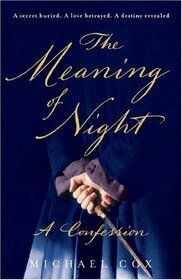 The Meaning of Night, by Michael Cox, is a novel of obsession turned psychosis, set in Victorian London. If you love fiction set in the Victorian period, especially of the mystery variety, you will enjoy this novel, but don’t expect the hero to be what you generally expect…This is a tale that smudges the line between protagonist and antagonist, turning the best of men into criminals and making light of serious crimes throughout. The reader will end this book shaking his head and blinking, trying to figure out the puzzle that is this novel, which plays with your sympathies and confuses your sensibilities. Can you feel sorry for a murderer?